I hadn’t blogged about it yet, but our farm’s picking actually ended at the end of October. Wow! That’s early. Usually picking can extend into January. We’ve already done our strip picking and cleanup. This is done to get all the fruit, including raisins (dried up cherry fruit) off the trees (and ideally, also off the ground) to help with the beetle problem. 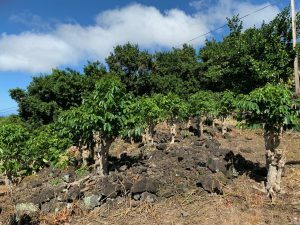 This article from a month ago in West Hawaii Today addresses this year’s strange coffee season being cut short. 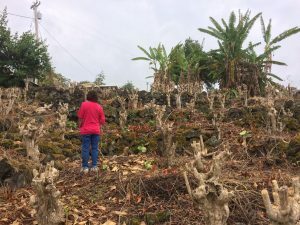 This has been such an unusual (and devastating, for those in the Puna district) year for the Big Island because of the big, long-lasting eruption. 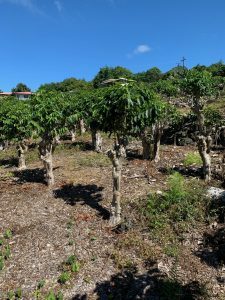 Unlike the farms mentioned in the article, our farm’s yield is up from last year, even with 1/3 less trees contributing, because of the better care and attention the land is receiving. On another note, I haven’t done one of these stump photo updates in a while. I didn’t capture the same perspective, but this is the general area. To me, the most obvious difference is the blue sky!! The last three months or so the sky has been blue. Here’s an article about giving thanks for clean air. 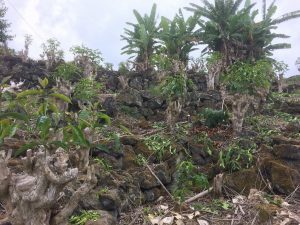 Next Post The 2018 Eruption — How were we affected?